Have the battery life issues finally been rectified? UPDATED: We've now updated this review based on usage of the Nokia Lumia 800 for around four months, which has included the first formal OS update, so take a look at our updated findings, complete with star rating. The Nokia Lumia 800 is the first Windows Phone handset to spring from the Microsoft / Nokia tie-up announced roughly a year ago. The Nokia Lumia 800 shares its exterior styling with the previously substantially less hyped Nokia N9, a Meego-based smartphone, although the screen size is reduced from 3.9 inches (854 x 480 pixels) to 3.7 inches (800 x 480 pixels) to conform to the Windows Phone spec list. The CPU, however, increases from the 1GHz ARM Cortex-A8 to the 1.4GHz MSM8255 Snapdragon/Scorpion which certainly helps add snap to the Windows Phone Mango operating system. The Nokia Lumia 800 (£400 SIM-free), although being the more expensive of the two Nokia Windows Phone offerings (the other being the £299 SIM-free/£199 PAYG Nokia Lumia 710) shares the Nokia N9's 16-bit AMOLED ClearBlack display whereas the Nokia Lumia 710 sports a 24-bit ClearBlack TFT. This being said, even though the colour depth is theoretically deeper than in the Nokia Lumia 710, AMOLED screens are seen as better than the older TFT technology due to the more vivid colours and better contrast ratios. Moving away from Nokia comparisons, the Lumia 800 also has to compete with the likes of the HTC Titan and HTC Radar Windows Mango phones. When we compare screen size we find the Nokia Lumia 800 feeling a little small with the HTC Radar and HTC Titan entering the fray with 3.8-inch and 4.7-inch screens respectively although all competitors are limited to the same 800 x 480 pixel resolution. Obviously the iPhone has managed to be a success with a smaller screen at 3.5 inches, but the trend towards bigger displays is increasing all the time, and we have to say we're fans of those over four inches thanks to the improved internet and media experience. This means that the pixel density on the Lumia 800 is a little sharper, but in our side by side comparisons we noted very little difference between them. When it comes to internal storage the Nokia Lumia 800 and HTC Titan are equal with 16GB of fixed internal storage, with the Nokia Lumia 710 and HTC Radar weighing in with 8GB a piece. Based on the two manufacturer's product specs it soon becomes apparent that the Nokia Lumia 800 is intended to compete against the HTC Titan and the Nokia Lumia 710 with the HTC Radar. When compared dimensionally with the HTC Titan (131.5mm x 70.7mm x 9.9mm and 160g) we note that the Nokia Lumia 800 (116.5mm x 61.2mm x 12.1mm and 142g) cuts a very slim profile, with a lighter yet reassuring weight. The physical appearance of the Nokia Lumia 800 is a dream to observe and handle, with its smooth curves fitting snugly to the hand both with and without the protective case provided in the purchase packaging. That said, if you're used to handling the current crop of super slim handsets doing the rounds in today's phone shops, you can't help but feel the Lumia 800 is a little on the chunky side, even compared to the iPhone 4S thanks to it being around 10 per cent thicker. However, that's not to say it isn't an attractive device, with its large 3.7-inch AMOLED screen pushed to the sides of the chassis and a cool curved polycarbonate shell gives the phone a very premium feel indeed. Nokia has worked very hard on the unibody design here, using top-mounted flaps to cover the charging port and SIM slot, but sadly leaving the battery inaccessible. Intriguingly, we're seeing a microSIM here, which seems to be the fashion for the next wave of smartphones. The battery is something we can get on board with as this isn't the first Nokia device to have an enclosed power pack and makes sense if it allows a greater design freedom. There was no easy option for battery removal on the Nokia N8 or Nokia E7, for example. The problem is that with a charge lasting no more than a day, the option to switch out the battery, as with the Nokia Lumia 710, would have been nice. The microSIM is somewhat more of an annoyance, since we couldn't even carry an old Nokia as a back-up because the SIM card is a different size. SIM card adaptors are available, but use them at your own risk since they have a tendency to wedge in some phones. Add to this the frustration when you find that some operators charge for providing a microSIM when on a standard SIM contract. The SIM to microSIM switch comes down to the simple issue of space. In the phone, the microSIM sits within the metal assembly bottom right. 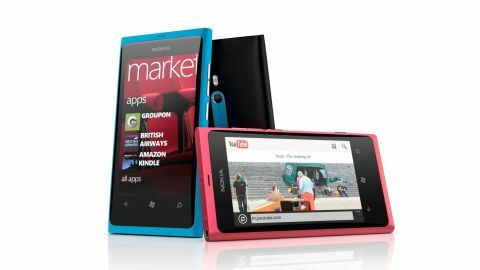 The Nokia Lumia 800 is quite reasonably priced, costing nothing on as little as a £26 Orange or Vodafone contract with Carphone Warehouse compared with HTC Titan starting at £31 pm with Vodafone and £36 pm with Orange.